Opposition leader Sam Rainsy left the country Tuesday, to visit family and report on the suspension of his National Assembly immunity to the Inter-Parliamentary Union in Switzerland. 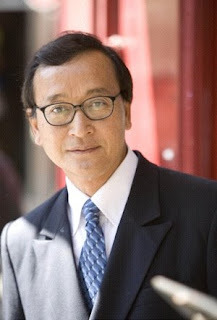 Sam Rainsy has been without immunity since a Feb. 26 vote to revoke it by the National Assembly’s Permanent Committee, after he failed to pay campaigning fines to the National Election Committee. He has since paid the $2,500 in fines, which were levied for allegedly disparaging remarks made about the leaders of the ruling Cambodian People’s Party during election campaigning last year. However, his immunity remains in suspension. Sam Rainsy said on Tuesday he would discuss the incident with European representatives of the IPU, an international body of parliamentarians.